Put your mind to rest for the night. We already know that writing a to-do list can help us hold ourselves accountable during busy work days. 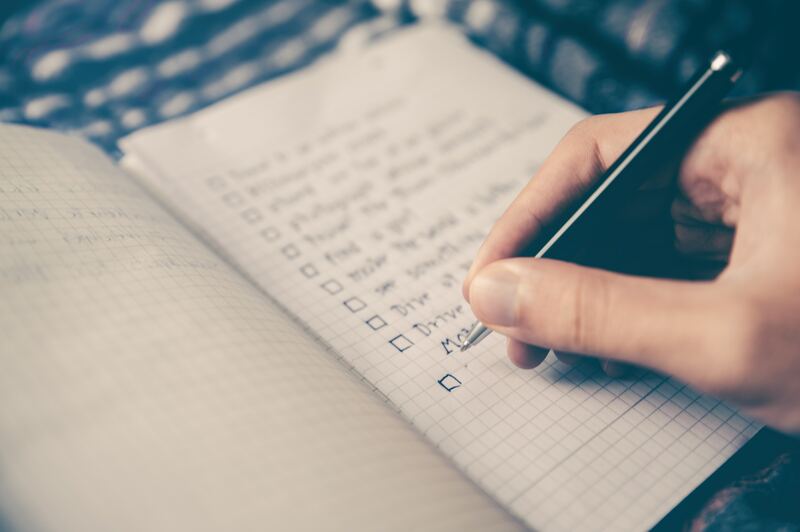 What you may not know is that your nightly to-do list can also be a way to cure your sleeplessness, as one new study published in the Journal of Experimental Psychology: General found. To test the power of a to-do list on our brains, a team led by Michael Scullin at Baylor University recruited 57 volunteers to fall asleep in a lab during a weekday. The volunteers were randomly split into two groups that were each told to do a five-minute writing assignment before bedtime at 10:30 p.m.
One group was told to remember everything they needed to remember to do the next day, while the other group was told to write down tasks they had already accomplished. The group told to write a to-do list fell asleep more quickly, taking an average of about 15 minutes to fall asleep, compared to the 25 minutes it took for the group told to write down tasks they had already done. What this finding suggests is that thinking about all the great things we have accomplished may not be the best way for us to to feel less worried at night. By forcing us to confront our unfinished long list of tasks we need to do, a to-do list may actually help us feel less stressed and more sleepy. The researchers theorize that to-do lists help us relax into sleep mode by helping us offload our worries onto the written page. “Most people just cycle through their to-do lists in their heads, and so we wanted to explore whether the act of writing them down could counteract nighttime difficulties with falling asleep,” Scullin said. Journaling your thoughts has already been found to help us boost our creativity and to relieve our anxieties before a high-pressure event. Now, we know that journaling specifically about the future goals we need to complete can help us feel relaxed enough to sleep better at night.